Hands-free biometric verification. 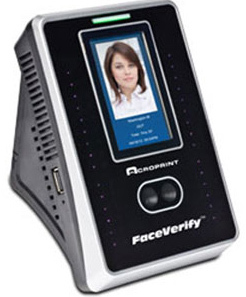 Employees clock in and out using facial recognition, a proximity badge, a PIN (or any combination of these) or via PC-punch. Using facial recognition, employees simply look at the terminal to clock in and out. 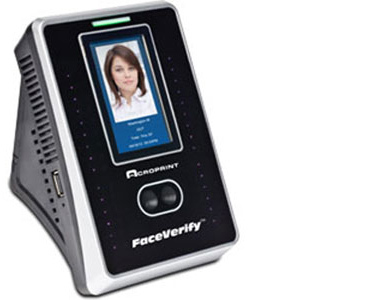 This complete solution includes: timeQplus Network software for 100 employees (expandable up to 250 employees) and one TQ600F facial recognition biometric terminal kit. The software also allows you to assign unique passwords and authorities to each manager. 100 Employees, English, French, or Spanish - you select. Upgrades in bundles of 25 employees, to system maximum of 250. Handles Weekly, Bi-Weekly, Semi-Monthly and Monthly pay periods, including up to 12 shifts and two levels of overtime. One year manufacturer's product guarantee, with 30 days of software support. timeQ+ software allows you to edit employee punches, view reports at your PC monitor, export data to 3rd party payroll programs, and save data to a text file. NEW: Job Costing allows your employees to punch IN/OUT using work codes for labor tracking. NEW: Unique passwords for managers, they can only adjust the punches for employees in their department. The Administrator can do everything. Exports directly to popular payroll formats, including QuickBooks, Paychex, ADP, and more. Software or user interface are available in English, French, and Spanish. One Year Manufacturer's Hardware Guarantee, 30 days free technical support. Simply look into the terminal. Verification takes less than one second. Infra-red optical sensors enables user identification in poorly lit environments. Use optional RFID Cards in high-employee turnover environments. of 100,000 transactions beteween downloads. Simply put, employees cannot beat the system - not even identical twins, or a photograph. Connects via Local Area Network (Windows), or USB thumb-drive.